1. The office hours are Monday through Friday, 9 a.m. to 5:30 p.m. Saturday, 8 a.m. to 2 p.m. We are closed on Sundays. 2. The office is closed on major holidays which are: New Year's Day, Easter, Memorial Day, Independence Day (July 4th), Labor Day, Thanksgiving, Christmas Eve & Christmas. 3. The gate hours are 5 a.m. to 9:45 p.m. everyday. A $10.00 cash fee must be paid to the manager if he/she must let you out after hours. 4. There is a one time $20.00 security deposit. 5. We require ten (10) days written notice prior to due date of intent to vacate. Failure to do this will result in a forfeiture of you security deposit. The deposit will also be kept if the unit is not clean and damage-free. 6. No flammable materials or food may be stored within the units. 7. All storage is at the tenant's risk. It is a tenant's responsibility to purchase insurance if so desired. 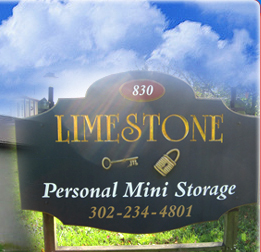 Limestone Personal Mini-Storage is not responsible for the contents of the units. 8. Double locking your unit is not allowed. 9. No partial payments will be accepted. 10. There are no rent refunds. 11. Late fees will be applied to all delinquent units. A $10.00 late fee and lock out is assessed after the 5th late day, and an additional $5.00 late fee is applied after the 20th late day. These fees continue until the rent is paid in full. lien status, certified correspondence and photos fees. There is a combined flat fee of $50.00 for these services. This is in addition to the rent and late fees. 13. If the rent has not been paid for 90 days or more, the contents of the unit may and will be sold at public auction. The money from this will go toward the unpaid rent. Should money still be owed on the unit, the tenant must pay or it will be turned over to collections. 14. No prorating of your last month's rent will be allowed. If you wish to contact us, call us during office hours at (302) 234-4801 (DE) or (610) 268-4181 (PA). You may also fax us at: (610) 268-4182.